Munroe could have been a sensation 10 centuries ago. 1. A simplification was found to Anselm's argument - using computers. See A Computationally-Discovered Simplifcation of the Ontological Argument by Oppenheimer and Zalta. You can even run it yourself (instructions and software). 2. 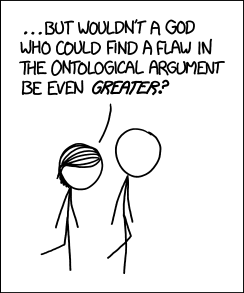 Godel's ontological proof, which uses modal logic, has recently been proven by computers (see also this presentation). Here is an open source project you can contribute to. 3. Then of course there is Maydole's Modal Perfection Argument. More explanation can be found here. 4. One can modernize Aquinas' Third Way with modal logic.